It’s not the sexiest or most powerful laptop out there, but $500 is a solid deal for a Dell with Windows 10 Pro, a 1080p fold-back touchscreen, and a 128GB SSD. The 4GB of RAM is a little lackluster, but you could upgrade that yourself later. $88 is within a few bucks of the best price Amazon’s ever listed, and you can choose from several different finishes to match your decor. Just note that is a Gold Box deal, so don’t get locked out of these savings. In today’s edition of “I can’t believe Amazon will ship heavy furniture for this little money,” we have an attractive wood TV stand for an all-time low $119. At this price, it’s obviously medium-density fibreboard rather than actual hardwood, but it has great reviews and looks quite nice for the price. Cooking eggs isn’t exactly rocket science, but I’d say the ability to make soft-, medium-, and hard-boiled eggs, plus omelettes and poached eggs at the touch of a button, is worth $15. 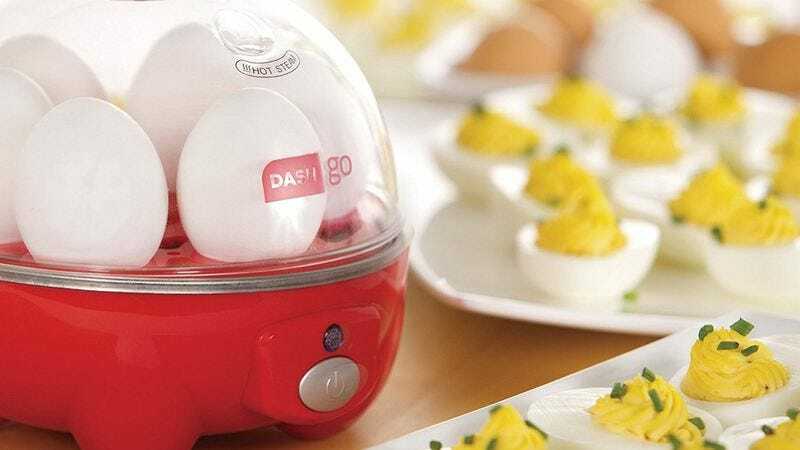 The Dash Go is Amazon’s top-selling egg cooker and carries a truly stellar 4.5-star review average from nearly 3,000 customers, so get the red model while it’s on sale for several bucks less than the other colors. If you’ve got the space for it, you’d be hard pressed to find an exercise bike cheaper than this. Despite the low price though, it still features eight levels of resistance, a screen to track your stats, and a 4.2-star review average. When you’re not playing games, the Xbox One is also a pretty great set-top streaming box. The only problem? The game pad takes a few seconds to wake up, which can be really annoying when you just want to pause a movie.